On behalf of TRUFA, I attended these events in Ottawa from November 22ndthrough 25th. Every year CAUT organizes meetings with Members of Parliament at which faculty association presidents from across the country can discuss key issues in the post-secondary education sector. On November 22nd, this year—as I have done for the previous few years—I met with Cathy McLeod (Conservative, Kamloops-Thompson-Cariboo), who serves on the Aboriginal and Northern Affairs Committee, and spoke about the need to boost funding for the Post-Secondary Student Support Program (PSSSP), which provides resources to Indigenous bands to allow them to send members to attend colleges or universities. I also met with Dan Vandal (Liberal, St. Boniface/St. Vital) and discussed two other CAUT priorities: the need to retain fair dealing aspects of intellectual property and copyright when Parliament reviews the Copyright Act; and a request for greater accountability to accompany federal transfer payments to the provinces, so that the money is targeted for post-secondary education. The governing body of CAUT is the Council, which meets twice a year in April and November. 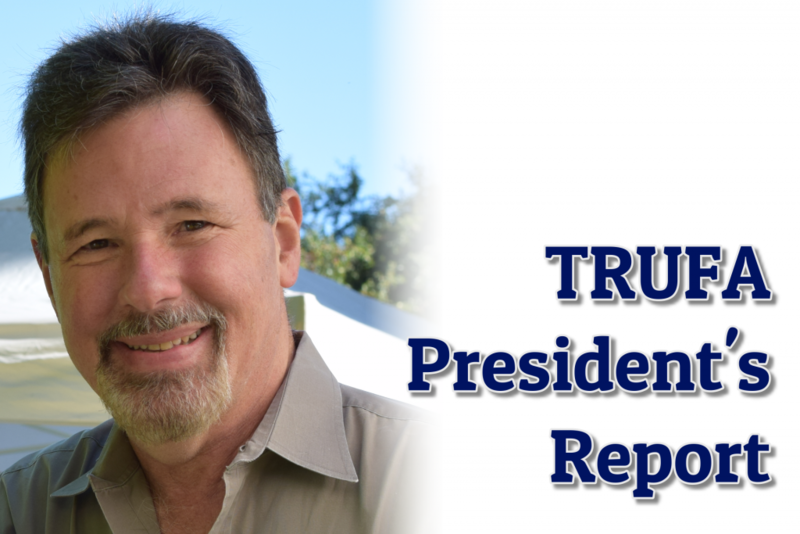 This year’s Council meeting included a report from the Executive Director on the establishment of an investigatory committee to determine whether Dr Derek Pyne’s academic freedom has been violated by TRU. As I’ve indicated in my early November message to all TRU faculty, TRUFA is actively engaged in protecting Dr Pyne’s rights. Given the union’s internal rules regarding confidentiality, TRUFA is not publicly revealing any details of this case. The TRUFA Executive has been fully briefed, however, on a confidential basis. The Federation will work with the Canadian Labour Congress to call on the provincial and federal governments to enact legislation that will make each level and field of education free and accessible to all and to forgive all student debt. N.B. This resolution was referred back to the BC Fed Executive Council with instructions to add the wor “public” to education. The Council will undoubtedly approve the amended wording. The Federation will support the granting of a tuition waiver to Indigenous students by all public British Columbia post-secondary institutions. The Federation will lobby the government to increase operating grants across the college and university system to fulfil post-secondary mandates. Please complete the TRUFA bargaining survey! 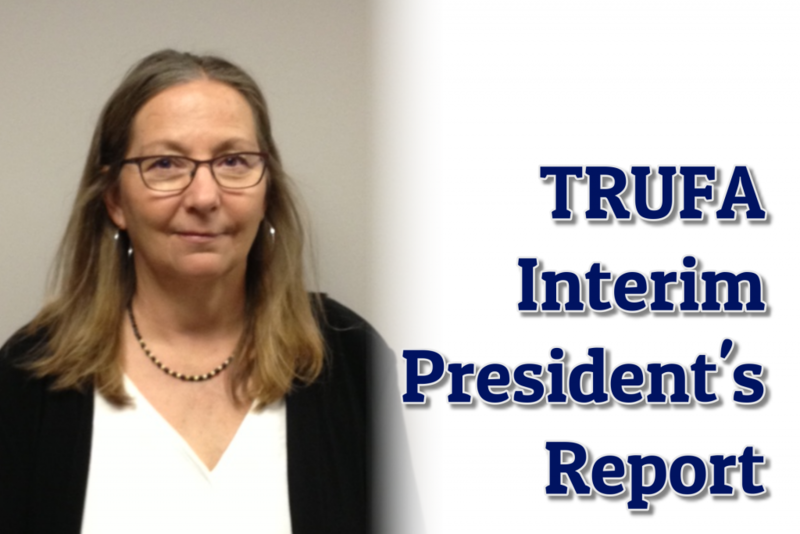 Along with consultations held with departmental/Faculty/School groups over the past 8 months, and concerns/issues sent to TRUFA by individual faculty members, the survey provides important information for the bargaining team. On behalf of the TRUFA Executive, TRUFA committee representatives and TRUFA confidential administrative assistant, Marian Griffin, I want to wish you a restful, re-energizing break.